Students stand in on the stage as preparations are made for the second presidential debate at Washington University in St. Louis. Donald Trump’s campaign is teetering on the brink. He had a horrible first debate, then started sliding in the polls, and then came the release of a 2005 tape in which Trump bragged about being able to sexually assault women. Scores of Republican officials are abandoning him, and Trump probably needs a strong second debate to get back into the race. Given Trump’s recent troubles and lack of debate prep, logic suggests that that will be a challenge. 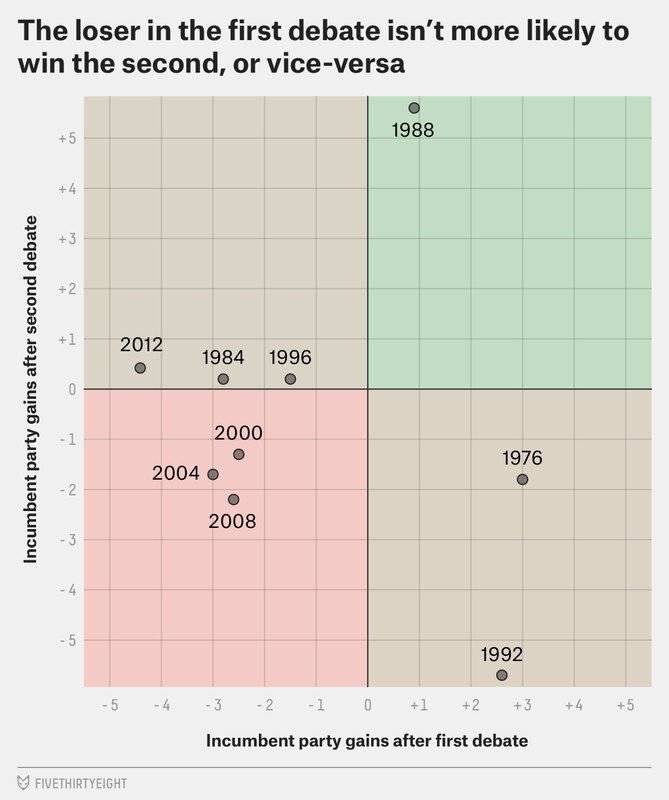 History too suggests that while a second-debate bounce is possible for Trump, it isn’t likely. Sometimes the candidate who does better in the first debate does better in the second too. Sometimes he does worse. Either way, there isn’t a tendency for the race to revert to some sort of pre-first debate polling equilibrium. That’s not to say that Trump has no shot tonight at making up significant ground. Both of the largest largest bounces (Bush in 1988 and Clinton in 1992) were larger than any bounce coming out of first debates. Moreover, those debates both showed that a big moment can move the polls. The second debate in 1988 featured Michael Dukakis’s famous answer on the question of whether or not he would favor the death penalty if his wife was raped and murdered. And Bill Clinton saw his poll numbers rise in 1992 after George H.W. Bush couldn’t really say how the national debt affected him personally. That answer came in a townhall style debate (as tonight’s debate will be). Even if tonight’s debate does move the polls, that’s no guarantee they’ll stay moved. Historically, the polls taken immediately before the second debate have been more predictive of the final election result than the polls taken immediately following it. Both Bush’s large bounce in 1988 and Clinton’s 1992 proved fleeting, for example. That doesn’t mean a Trump bump after tonight necessarily would be, but there hasn’t been a single time when the polls conducted after the second debate were significantly more predictive than those taken before it. Meanwhile, there are examples, such as 1988 and 1992, of the opposite being true. Second debates simply haven’t been great venues in which to change the trajectory of the race. In this case, that’s bad for Trump, since he’s losing. But as with all studies of modern presidential campaigns, we have only a small sample of examples to work with. So this analysis doesn’t mean Trump won’t right the ship tonight. It just means you shouldn’t bet on. In some years, we’re looking at less than a week’s worth of polls. In 1992, for instance, the second debate came four days after the first debate and four days before the third debate.